Wholesome & hearty. With Scottish wholegrain oats. Suitable for vegetarians. 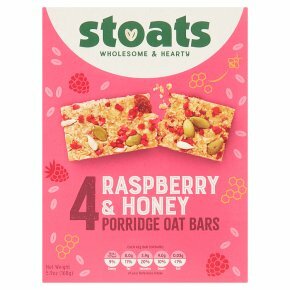 A classic fan-favourite, our raspberry & honey porridge oat bars are made by hand with wholegrain Scottish oats, creamy butter, tangy raspberries and sweet honey. Packed with natural goodness and a source of fibre for a deliciously filling treat. From on-the-go snacking to savouring with a cup of tea. Proudly made with real fruit so may contain the odd pip, shell or stalk.